This is a revised version of the insert and it has been redesigned to have space for both expansions, The New Characters and The Agents of Venice. Here you can see the full game box, with the rules, boards, and player boards on top of the insert trays. With the rules and boards removed you can see underneath the top layer of trays. 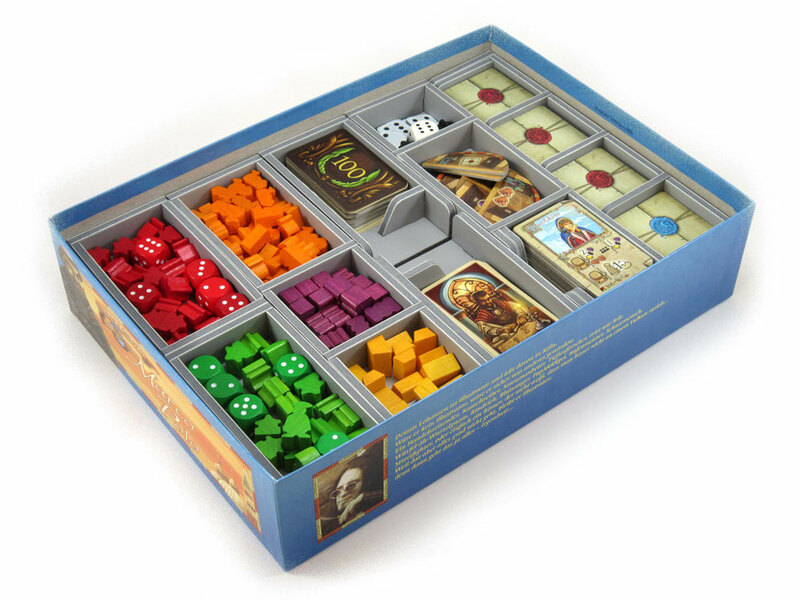 The top four trays are individual player pieces trays which are removable and usable by the player during the game for keeping all their pieces tidy. The next tray down contains the money, the gift markers, and the pepper bags. The next tray contains half of the character tiles, the Large City Bonus tiles, and the white dice and other smaller components. The bottom tray contains four slots for the contract tiles. With the top layer of trays removed you can see the second layer underneath. At the top are two special trays for storing the game cards, either sleeved or unsleeved. Then there is a tray for the companion tiles, and the last of the player piece trays. Next is a tray for the other resources. Then we have a tray for the remaining character tiles, the Small Town Bonus tiles together with the hour glass piece, and lastly the black dice. The bottom tray is the second contract tile tray. Here you can see the trays removed from the box ready for game setup. Note that each player will take his own player piece tray to use during the game. The resource and money trays are placed next to the board for easy access. Note also that the contract tile trays are open at one end so the next round's stack of contracts can be removed simply one by one as the game progresses. Now the box also includes additional board pieces and player boards, the box does not close fully flush with everything inside. The box will stay open a few millimetres. This does not in anyway effect transport or vertical storage of the game.